Whether you’re throwing a black-tie gala or charity auction, or organizing a philanthropic run or walk, planning and executing a fundraising event is a full-time job. There are simply so many details that you have to keep track of, and oftentimes it can feel overwhelming. So why not add in an event software program to help you get organized? There are a variety of different software solutions out there that can assist with everything from donor screening, to charity auction management, to event ticketing and communications. No matter which software program you choose, you’ll be well on your way towards taking your fundraising event to new heights. Though not technically an event fundraising software, DonorSearch’s donor screening functions can nevertheless be extremely helpful during and after your organization’s fundraising events. With DonorSearch, you’re able to screen event attendees to determine their giving capacities. As a result, you’ll discover which supporters might have the capacity to make large donations in the future so that you can focus more attention on cultivating them. Additionally, DonorSearch’s in-depth analytics and modeling features allow you to accurately predict future giving, thereby informing future fundraising events. When researching donor prospects, DonorSearch’s team understands that wealth indicators are only part of the equation. As a result, DonorSearch examines philanthropic data in conjunction with wealth indicators to provide a more complete view of each individual donor. Additionally, DonorSearch verifies its findings manually using in-house prospect research professionals, so you can be sure that the information you are getting is 100% accurate. Consider how DonorSearch’s software would work for you. Imagine you’re hosting an upcoming fundraising gala. It’s a black-tie event, and it is focused on cultivating relationships with new donors. You would use DonorSearch’s tools to screen your RSVPs and make a plan for how your staff will target key major giving prospects on the day of the event. For budding organizations, DonorSearch offers a public access online giving tool that allows you to screen event attendees for free. To receive access to DonorSearch’s full software platform, contact DonorSearch directly for a quote. Discover more about DonorSearch's software solutions! While Double the Donation is also not strictly a fundraising event software, it provides a vital service through its universal matching gift tool, which proves essential to ensuring a successful fundraising event. Attendees are able to ascertain their matching gift eligibility right from your donation form or website. Double the Donation’s matching gift tool is completely integrable! No matter what program you used to design your website or donation form, Double the Donation will fit in seamlessly. From your online donation form to your website, your donors can find and easily use this tool to double their donations for your organization! To truly capitalize on matching gifts during events, you’ll want to find a way to tell you attendees that their donations might be match eligible. You could include signs around the event, ask your host to mention it, share the information in your gift receipts, or even have staff make post-event calls to all attendees who donated. For example, imagine you’re hosting a peer-to-peer fundraising walk for breast cancer research. You would want to make sure all your fundraisers are aware of the matching gift potential and are sharing that information with their donors. Double the Donation’s basic package is listed at $299/year while their premium package sits at $499/year. Their most extensive matching gift option, 360MatchPro, starts at $3,000/year. Discover more about Double the Donation's software solutions! Though Salsa is mostly known for its comprehensive nonprofit CRM solution, its donor management software has event features as well. Because Salsa’s CRM gives you so much information about your donors, it’s a cinch to organize and manage specific events. With Salsa, nonprofits can create and manage peer-to-peer fundraising events, or create event registration forms within the software. For most nonprofit fundraising events, the more information you have access to, the better. Using Salsa allows organizations to see a complete picture of their donors, including giving levels, previous event attendance, and contact/communication information — all of which can inform event management so that it’s tailored to donors’ needs and interests. Salsa’s event management software is most helpful when used in conjunction with its other features. For example, if your organization uses Salsa’s CRM and is planning a fundraising event, you can ensure data transfer is seamless by using the Salsa event registration feature. Then, when attendees sign up for your fundraising event, their info and data automatically filters back into your Salsa CRM database for future use. Contact Salsa for more information on the cost of their event fundraising software. Learn more about Salsa's software solutions! OneCause is known primarily for its robust charity auction software, but it also offers more general event management software that works great for all types of fundraising events! OneCause’s powerful technologies offer the ability to handle ticketing, registration, checkout, payments, event management, and reporting — all within one streamlined platform. Additionally, OneCause gives your event staff the ability to capture attendee information, track registrations in real time, and accept payments for tickets or bids in one place, either via computer or mobile device. OneCause’s fundraising event software centralizes all the typical components of event fundraising into one software solution, making it easy to manage all aspects of your fundraising event. OneCause also offers full integration with all major social media sites, allowing you to share your fundraising events with the broader online community. Even better, with OneCause, you can manage an unlimited number of annual events — all for the same price. Wondering when and how to use this software? The answer is straightforward… for any fundraising event you host. OneCause’s comprehensive event management features mean that if you’re hosting a fundraiser, you can use OneCause. OneCause offers three different packages that vary in the services they offer. Contact OneCause to get a quote for your organization’s needs. 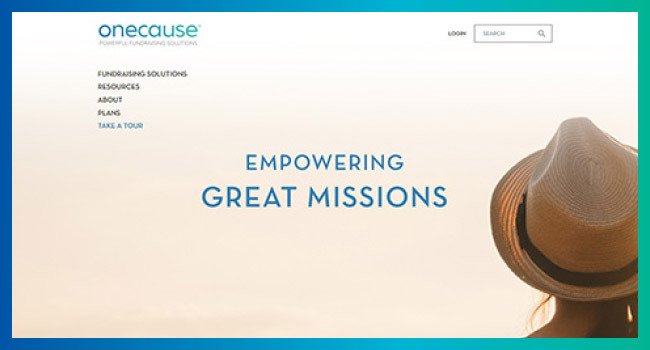 Learn more about OneCause's software solutions! ePly provides your association with an excellent solution for all its event management and registration needs. Watch as your event registration difficulties become a thing of the past! With eTickets, custom registration forms, real-time data reports, and a custom mobile app, your association can smoothly host a conference or symposium while also using data to understand how effective your efforts were. Plus, when you choose ePly, you not only get the software package but also a team of professionals who are willing craft professional-looking websites and apps for your association’s event, leaving you to focus on the important things (like building lasting connections with attendees). ePly’s event management and registration software is highly customizable to each association’s individual needs. This means that even multi-department associations that track large numbers of members don’t need to worry about hosting a great event. ePly’s app provides helpful information to your attendees such as itineraries and programming. It can also be customized to align with your association’s brand for increased visual coherence. ePly helps associations host conferences or networking events while also collecting useful data about its registrants. You can use ePly during the registration process to better handle check-in and check-out while obtaining great info about your event in the process. Since ePly offers a variety of pricing plans, you should see ePly’s website for additional pricing details. Learn more about ePly's software solutions! Fundly’s main product is its crowdfunding capabilities, but did you know that it also offers CRM software? With Fundly’s CRM, you’ll receive a one-stop shop for everything donor-related — including a robust fundraising dashboard. This allows users to view registration trends, create recurring events, integrate box office ticketing, and customize tickets and receipts. Fundly’s CRM also comes with email marketing functionality to help you publicize and promote your fundraising events to your supporter base. Additionally, because Fundly’s event management software is included within the larger CRM, you don’t have to worry about data migration or having to re-enter information. The software is a great option for nonprofits that are looking for a complete, yet affordable, solution. Imagine your organization raises money to combat cancer and you’ve organized a silent auction to raise money and awareness. With Fundly’s CRM software, you can manage the event planning and registration. And with Fundly’s crowdfunding software, you can hold an online fundraiser as a lead-up to the event. Fundly’s CRM software comes in a variety of packages, the lowest of which starts at $55/month. Of course, any nonprofit can start a crowdfunding campaign for free! Find out more about Fundly's software solutions! Bonfire’s revolutionary event fundraising software allows your organization sell merchandise! Bonfire provides your nonprofit with an extensive catalog of merchandise that you can design and customize for your event and to your donors’ liking! With all different sizes, styles, colors, and fits, your organization can sell multiple products so every supporter gets their favorite shirt, tank top, or sweatshirt. Bonfire is so easy to use you’ll have your campaign set up in just a few minutes. You’ll first choose the products you want to sell, then you’ll upload photos or design your shirt on Bonfire, you’ll set your selling prices, and lastly, you’ll set the dates for your campaign and customize your webpage. It’s as simple as that! To promote your upcoming fundraising event, your organization can sell promotional t-shirts. Spread the word about your Bonfire campaign via social media and email! Bonfire is completely free! They charge an 8% fee on additional donations made at checkout and shipping is a flat rate fee of $5 for anywhere in the U.S. Discover more about Bonfire's software solutions! Qgiv offers a slew of event fundraising solutions to handle your nonprofit’s needs from planning through execution. Your team can register supporters, launch peer-to-peer fundraisers, accept gifts on-site, and collect donations via text-to-give. No matter what kind of fundraising events your nonprofit hosts, you’ll be able to find a solution to fit your needs. We love Qgiv’s event fundraising platform because it gives nonprofits the tools they need to make giving convenient for their supporters. With their online donation forms, supporters can easily make a gift from the comfort of their computer. If they decide to give on-the-go, they can also contribute using their smartphone. Some supporters will want to give on-site at the event, and Qgiv has a handheld kiosk solution to meet those donors where they are. If your nonprofit hosts a walkathon, Qgiv has a whole ecosystem of solutions to help you reach supporters across the board. You can use their peer-to-peer fundraising tools to leverage the support of your constituency before the event. At the event, you can accept gifts via phone or handheld kiosk. Qgiv’s fundraising software plans start at just $0/month with a 3.95% + $0.30 transaction fee. Find out more about Qgiv's tools! While not a fundraising software per se, Smartwaiver offers software that helps organizations create custom waivers for adventurous events. 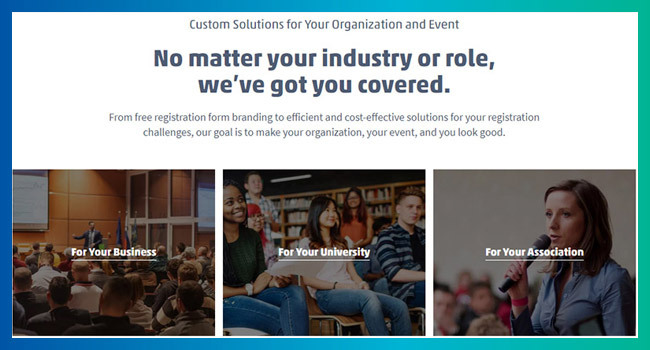 With Smartwaiver, your nonprofit can create digital waivers that embed into your website so that your next event is safer than ever! Make signing a waiver a part of the event registration process so that participants can sign ahead of time and be ready to roll when it’s time for the event. With Smartwaiver, your nonprofit can use the online Waiver Editor to make sure your waiver is customized with your brand’s colors, logos, and fonts. Then, you can save the waiver as a template for future similar events! The robust editing capabilities of this software allow your nonprofit to add multiple initial and signature boxes into the body of the waiver. Plus you can set up as many custom questions as you need and flag participants when a specific answer is chosen. Add a safety or instructional video to the digital waiver signing process so that your participants are as prepared as possible for their upcoming adventure! If your nonprofit is hosting an event like a 5K, you might decide to require participants to fill out a liability waiver. You could edit the waiver to include all of the custom fields and questions you need then make it available from your event registration page. You should also make sure participants can sign the waiver from the event itself with a mobile kiosk. While they’re signing, you can enable auto photo capture tools to take a picture of the person signing the waiver as an additional identification tool. Check people into the event to make sure all of your participants have signed the required waiver. All of Smartwaiver’s plans include all of their amazing features. Their basic plan includes 100 new signed waivers each month and starts at $15 per month. As you grow in the number of new signed waivers you need each month, you can upgrade your plan. Find out more about Smartwaiver! 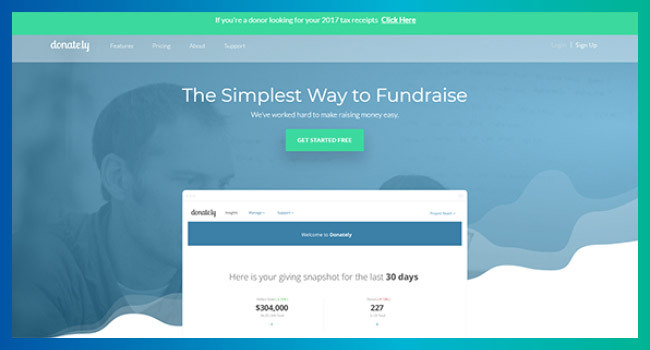 Donately is a comprehensive online fundraising software platform that connects nonprofits with easy-to-use, seamless fundraising tools. With Donately’s giving platform, giving forms are easily customizable and can be embedded right in your nonprofit’s website. Using their in-person donation forms, your organization can accept gifts at fundraising events without hassle. Since they also offer peer-to-peer fundraising, you can call on supporters to fundraise on behalf of your cause leading up to the event. We love Donately because their donation form builder is easy to navigate, no matter your online fundraising experience. 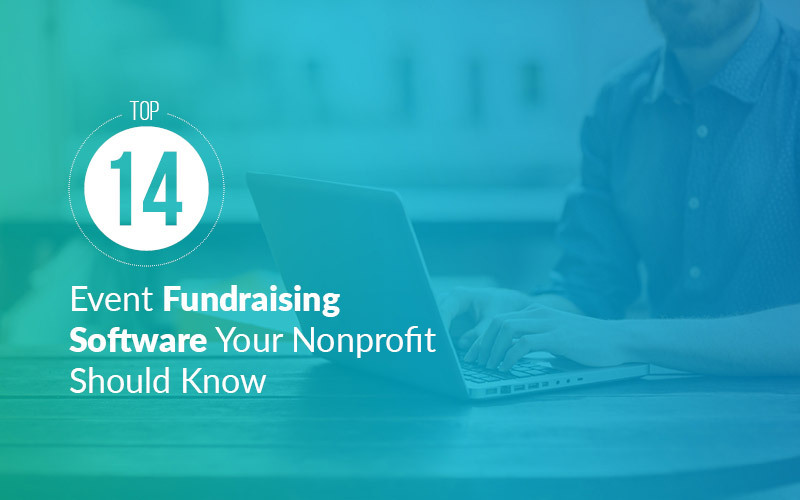 Since their software integrates with all your favorite apps, you’ll never miss out on leveraging important donor data that you collected at your fundraising event. All you need to do to launch a beautiful donation page is use their intuitive design tool. In minutes, you’ll have a compelling page that your donors can access anywhere. When you accept gifts in-person that correlate with your ongoing fundraising campaigns, that data seamlessly integrates so you’re never in the dark about your fundraising progress. Donately charges just 3% on your first $100k in fundraising proceeds; after that, their rates go lower as you reach big fundraising benchmarks. Find out more about Donately's tools! 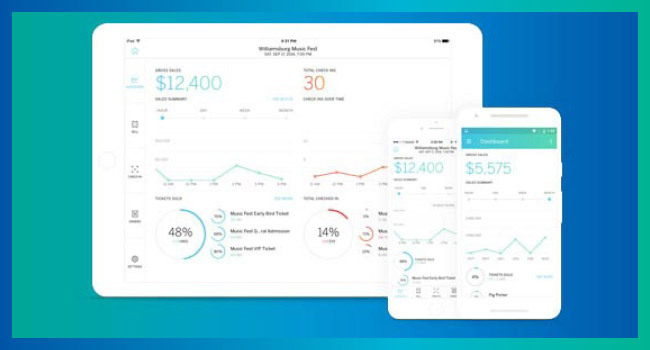 With event management software designed specifically for nonprofits on Salesforce, Fonteva’s solution is a unique, yet comprehensive option for nonprofits who want a streamlined, intuitive event integration. Event set up, registration, and attendee management. Speakers, sponsors, and venues management. Connection to over 90 payment processors. Fonteva’s software also lets you coordinate all your fundraising event details from one place to help run any event smoothly. A native platform, Fonteva Events is built on top of Salesforce so that data is integrated in one system. Fonteva’s dynamic software naturally integrates with the Salesforce platform, making your event management software swift and easy to use. Their software is also always up-to-date and features customizable and branded registration pages. To top if off, Fonteva gladly handles all maintenance and upgrades of their Cloud-based software at no cost to your nonprofit! If you’re a Salesforce user, you can and should use Fonteva for all your event needs. Because the software is comprehensive, you should have no issue organizing your event, from start to finish. Fonteva Events lets you manage all your fundraising events — large or small, free or paid — for just one annual fee. There’s also no software to install and three free upgrades per year! Learn more about Fonteva's software solutions! Agilon’s event management software equips nonprofits with all of the tools they need to plan and execute successful fundraising events. Agilon’s events module allows you to promote your event across multiple marketing channels, automate event calendars and registration, streamline invitations and guest lists, track important dates and contacts, and more. Agilon’s event software was designed in partnership with foundations to enable the best experience possible for donors. The software leverages donor preferences and relationships to make it easy for donors to RSVP, pay, and include donations or merchandise purchases with a single transaction. Like many of the other software options on this list, you can use Agilon’s event module for top-to-bottom event management. To maximize the fundraising efficacy of your Agilon software, embed a tool like 360MatchPro into your donation page. 360MatchPro will even automate your follow-up with attendees who are matching gifts eligible, which can drastically increase the success of your event. With a matching gifts option included in the streamlined RSVP/pay/donate page, you can easily follow up with the necessary resources for your attendees to maximize the impact of their gifts. Contact Agilon directly to request a quote. Learn more about Agilon's software solutions! DonorPerfect’s fundraising growth platform houses a bevy of crucial tools and software to help augment your nonprofit’s fundraising efforts, including a robust events management unit. This software can help you manage fundraising event details; track expenses; generate and manage invitations, RSVPs, and payments; and export guest contact information. DonorPerfect is a company built for nonprofit professionals, by nonprofit professionals. This means that DonorPerfect fundamentally understands the unique needs of nonprofits, meaning they are better equipped to address them. Since this software is designed to work in conjunction with other donor management tools from DonorPerfect, you could use this event management software to ensure that your event is more than just a one-off fundraiser. Instead, you can see to it that your event builds on your previous donor knowledge and positions your organization for better future growth. DonorPerfect offers several different software packages to meet your nonprofit’s needs and budget. They range in price from $159 per month to $459 per month. Discover more about DonorPerfect's software solutions! You’ve probably used Eventbrite to purchase tickets to shows or other specialty events, but did you know that you can use it to create your own fundraising events? Eventbrite’s event software is as easy as creating a page and promoting it. The interface is simple and user-friendly, and Eventbrite offers a number of integration options ranging from payment processors to charity auction software to crowdfunding software. Eventbrite’s software is truly a one-stop shop for managing every single detail of your events, including such nuances as the type of ticket you’ll provide or designing an interactive map of your venue. Even better, Eventbrite offers a discounted rate to registered nonprofits that are looking to use their service. Eventbrite is a superb option for nonprofits that have not yet invested in their own donor management software (which typically comes with its own events features). If your organization is small and/or new, Eventbrite will give you all the tools you need to organize a fundraiser. Eventbrite charges a service fee of 2.5% + 99¢ per ticket sold, plus a payment processing fee of 3% of the ticket price. However, if you are designing a free event, Eventbrite’s services are free! Learn more about Eventbrite's software solutions! These fundraising event software options each provide slightly different benefits to your organization, but all of them will help catapult your fundraising event to new heights of success! DonorSearch’s Top 7 Charity Auction Websites. Now that you’ve read up on the best fundraising event software solutions, are you motivated to host a charity auction? If so, take a look at the best charity auction websites to help your even run smoothly! DonorSearch’s Fundraising Strategy: The Gift Range Chart. Are you focused on fundraising after reading about our top event fundraising software? Don’t worry, check our guide on the gift range chart to help your improve your fundraising strategy! OneCause’s 17 Phenomenal Fundraising Event Ideas. As you know, your hard work is only successful if you have a stellar event idea! For inspiration and the best event ideas, check out OneCause’s list.